Are you a fan of Madam Secretary? This week, CBS announced the TV show is now available on Netflix. The political drama stars Tèa Leoni as Elizabeth McCord, a shrewd and determined Secretary of State who drives international diplomacy. The cast also includes Tim Daly, Željko Ivanek, Bebe Neuwirth, Patina Miller, Geoffrey Arend, Erich Bergen, Wallis Currie-Wood, Kathrine Herzer, and Evan Roe. As part of a new syndication deal, the first three seasons of Madam Secretary are currently available to stream on Netflix. Season four will arrive on the streaming service in mid-2018 and WE tv will begin broadcasting the CBS series on cable around the same time. 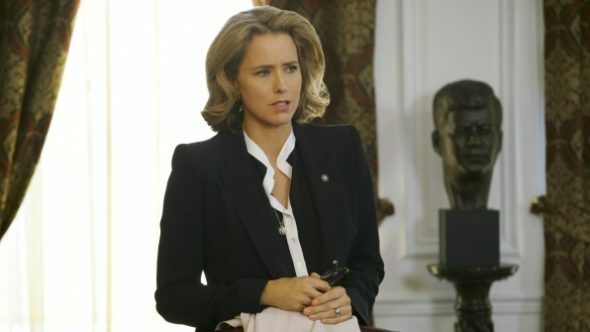 STUDIO CITY, Calif. – Sept. 28, 2017 – CBS Corporation announced today a significant multi-platform syndication agreement for its political drama MADAM SECRETARY starring Téa Leoni, windowing the off-network rights for the series with distribution partners across a subscription video on demand service, a basic cable network and broadcast television stations. As part of an agreement with Netflix, all three previous seasons of MADAM SECRETARY are currently available on demand, with season four coming to the subscription service sometime in mid-2018. WE tv, part of AMC Networks, has acquired the off-network rights to present MADAM SECRETARY, which will begin running on WE tv in 2018. As the home of high-quality programming featuring diverse characters and voices that resonate, the network successfully connects with viewers through programming that is authentic, relatable and aspirational, as demonstrated by the network’s position as the #1 U.S. cable network for African-American women and adults on Thursday nights and a top five destination for women on Friday nights. “Our growing viewership has demonstrated a clear interest in real and relatable characters through WE tv originals on Thursday and Friday nights and popular acquired shows like MADAM SECRETARY, an acclaimed series that aligns well with our brand,” said Marc Juris, president of WE tv. In addition, MADAM SECRETARY will launch in weekend syndication in the fall of 2018 in premier time periods across some of the best TV stations in the country. The series follows a long legacy of dramas that have excelled in broadcast syndication, such as the “CSI” and NCIS franchises, CRIMINAL MINDS and BLUE BLOODS. CBS Television Stations will serve as the flagship for this endeavor. What do you think? Are you a fan of Madam Secretary? Will you watch the show on Netflix? More about: CBS TV shows: canceled or renewed?, Madam Secretary, Madam Secretary: canceled or renewed?, Netflix TV shows: canceled or renewed? Love this show. Plot, actors, script are all superb! Looking forward to Season 5. Madam Secretary is my favorite TV show too. I have watched the first 3 seasons on Netflix twice, and can’t wait for this season to show up. I don’t take regular TV streaming as I’m retired and on a rather low income (it cost $71 a month! ), so I’m sorry I’m not part of the regular ratings. Madam Secretary my favourite must watch show. Devastated can’t watch now as I do not have Netflix. You can take out older seasons from your local library too, though they will probably lag behind Netflix for a while. My favorite tv show. So glad Season 4 will eventually be on Netflix. Madam Secretary is a refreshing, intelligent, mostly moral forum of entertainment, with great story lines, and should be continued for those of us who are above the coveted 49 years of age and up age group. Most of us watch on Netflix so how about counting that number when calculating popularity of a TV show? Worthymagic is crazy not to like this show! How refreshing: educated, intelligent people solving their business and personal problems in a mature and thoughtful way. A favorite; always Netflix. One of my top 3 must see’s. Love this show! This show is awful. The ratings it gets are awful. Thanks to Netflix, it might even see a season five. That would be awful. I guess they bought it dirt cheap. Another reason not to get Netflix. An absolute favorite! Not using Netflix or streaming. Only on regular broadcast, and always TIVO’d. Wonderful and suspenseful show. A must see in our house.